For a more personal take on things than the offical news announcements. 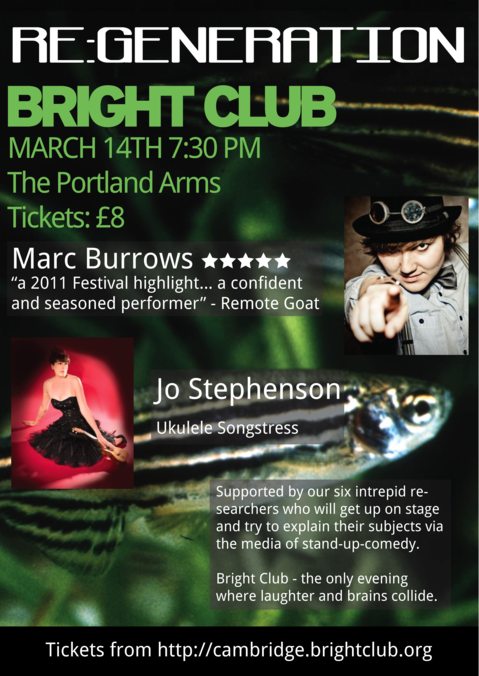 I’ll be coming out of sabbatical with a gig tonight at Cambridge’s Bright Club Re:generation event during the Cambridge Science Festival. I’ll be unveiling two new Professor Karmadillo songs to the public – one on the Mars Curiosity Rover, and t’other on one of the freakiest looking creatures that also aids cancer research – the naked mole rat. It also looks like some bits need tweaking with the website and I’ll be changing mailing list provider, so I’ll soon be back to updating you regularly with Karmadillo and Professor Karmadillo shenanigans! Jamie Oliver is doing a bash called the Big Feastival. There is also an unsigned band competition running for this – I would love to entertain assembled diners with tales of brain eating and death by chocolate – who knows, it could give him a new recipe idea! So please vote for Karmadillo at http://thebigfeastival.herokuapp.com/tracks/28 to make it happen! Took the charango out its case this week, and gave it a little strum. Felt good, but tempered by the fact this was at 6am! Need it as I have two gigs this week, and luckily the baby doesn’t get woken by it from the far side of the flat. Hope the same applies to the neighbours! Will fit rehearsing in around work and baby hours. The gigging is a pain to get started again but it has got me going again to the point where I’m planning the next album. When I can record it is another matter! Anyway, this album has now been released on digital stores, together with additional tracks, as an enhanced version. The version on Bandcamp will be updated to include the new tracks soon as well. Thank god for baby monitoring systems. Finally after weeks of linen and cream oriented purchases can buy something ELECTRONIC!!! I like the Tommee Tippee one as the range allows us to get some fresh air thanks to 300m on the re-chargeable docking station. There is some sort of noise floor detector so it turns off the audio if no sound is being made, and has lights on the handset even if the voice is turned down. The BT one also had lights, but was a bit less elegant. It also gives a temperature monitor which was one thing we were after in particular. At the moment we haven’t used the motion detection via mattress system, and there are other bits and bobs like remote controllable night light and a two way talk system which allows me to have conversations with the wife while she is holding the baby. Why the Snuza might be nice is that they have a base unit that is battery powered as well, making it a bit more portable. Well it was a bit stressful organising as well as playing a gig but at the end of the night we had raised £180 for Addenbrookes Osteopath clinic and Chesterton Medical Centre Physiotherapy Department who have spent the last year operating on and tending to my knee respectively. It was the last full gig I’m doing before the baby comes along (and probably the last one I do for a few years after the baby is born as well!) so it was nice to see so many people turn up and support the cause. Particular thanks must go to the support acts – Tom Conway and Jacqui & Geoff for playing. The support act from London didn’t show, and didn’t let us know she was not going to show, but I understand its scary for some London born and bred types to go beyond the M25. Still, it gave me the chance to do an extra mini acoustic set between the other acts, which was quite nice as I had been fretting how to squeeze everything I wanted to play into the single set. David Young also had to pull out, but at least he let me know. Being due to his wife being imminent with a baby as well, I totally understand. I am glad to say his wife has given birth this week, so congrats to the proud mum and dad. Graham Coxon support slot – help a Cambridge band! So ex-Blur dude Graham Coxon is running a competition for a band to support him. I’d quite like to be able to support him at The Junction in April, so to that end would like to suggest you nominate the zombie youtube video. Obviously you can nominate whichever band you wish – but it would be cool if it could be a Cambridge one! Go to http://toursupport.grahamcoxon.co.uk/, login with Facebook or Twitter, choose Cambridge and then (ideally!) nominate the Karmadillo Teenage Zombie vid. You can do it by entering http://www.youtube.com/watch?v=xbdcGILO9xE in the popup. Or choose a video by the many excellent Cambridge bands! You can also show support for the bands by Liking the videos you like. Thanks for listening, and efforts if you help the Cambridge musicians! It being Christmas and all I thought I would get down and make progress on the Professor Karmadillo album that is being recorded at the moment. Being dis-satisfied with the freeware reverb plugins I have and ones that came with my Cakewalk Sonar package I decided to go on the hunt for something new. Tally Ho! I have one friend who works for Sound on Sound Magazine. His personal favourites are EastWest Quantum Leap Spaces and Flux IRCAM Tools Verb, which came with a its-quality-but-pricey warning. I investigated those and while I don’t mind paying a price for quality reverb I don’t particularly want to have to carry a dongle around to use my laptop for recording, which ruled those two out. His third recommendation was Valhalla Room, though he hadn’t used it personally. Immediately I warmed to this software. It has effects that are named Sulaco and Nostromo for starters. The price was much less that the other two and the developer is donating 10% of all ValhallaRoom proceeds to the American Red Cross International Disaster Relief Fund. Liquid Sonics also did something which he highlighted. Finally two other recommendations came via a fellow artiste Matt Parker – King Dubby and Blue Cat. The former was Mac only and the latter was stuff I couldn’t get into. However the Blue Cat tools seemed excellent for analysing and mastering stuff, so I’ve made a mental note to check their stuff out down the line. The next step is the process of trying these out and seeing which I like the most!